After visiting the Dairy Free Fudge web site, J. 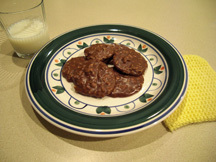 Darling found that she could modify the Mallow-Free Chocolate Fudge recipe to make a delicious No-Bake Cookie that is "just like" her Grandma’s. Asking her if she'd like to share the recipe with us she said, "Yes!". So to our delight, and what will be yours...here's "Grandma's No-Bake Cookies" recipe. In a 1.5 Liter or larger microwaveable bowl, mix cocoa, oil, sugar, milk and salt. Remove from microwave, lightly stir and scrape down sides of bowl with a high-temp spatula. Remove bowl from microwave, add vanilla and peanut butter. Stir for about 5 minutes or until mixture is thickened to a stiff, pudding-like consistency. Stir in oats about a 1/4 cup at a time. When mixture begins to thicken/harden, drop by spoonfuls unto wax paper in "cookie size" amounts. Let set, enjoy! For more thorough fudge making instructions, if needed, see the Mallow-Free Chocolate Fudge recipe on this web site. You can make "Peanut Butter No-Bake Cookies" by making the Peanut Butter Fudge recipe and adding 1 1/4 cup oats. You can probably use almond butter if you're peanut allergic, the healthy nut butters (peanut and almond) make for creamy No-Bakes. When "kitchen testing" this recipe at Dairy-Free Fudge, I found that sometimes, it takes the No-Bakes a long time to harden (probably from my under-stirring). I found one batch took 2 - 2 1/2 hours to set up. But if they never harden, you could try this: Using a nylon or rubber spatula, scrape the No-Bakes off the wax paper into a microwaveable bowl, microwave on HIGH for 1 minute and stir for a couple of minutes. When mixture begins to stiffen, drop by spoonfuls onto wax paper. Because there are many varied factors (microwave function, stir times, even milk temperatures), and you find your No-Bakes consistently won't harden, try reducing the amount of milk used by a tablespoon or so, until you get your perfect Grandma’s No-Bake Cookies!